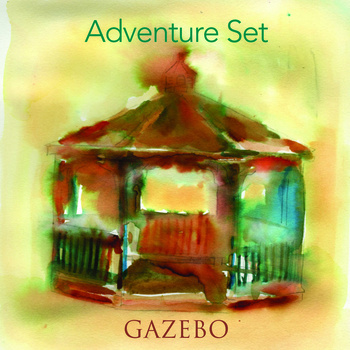 EP Review: Adventure Set, "Gazebo"
Interesting four-song e.p. from Boston synth-duo Adventure Set, who are comprised of singer Ken Scales and multi-instrumentalist Mark Pothier. For this mini-album, they’re aided and abetted by producer Stephen George, who also provided additional keyboards and programming. I’ve listened to some neo synth-pop releases in the last few months and this one, like the others, has a freshness about it – something the original synth heyday of the ’80’s lacked. I know I often use the word “crisp” when I speak of production, but this has it – an openness and a warmth – again, something synth-pop previously was void of. Ken Scales has a fine voice and the melodies and hooks supplied by Mark Pothier are plentiful. “Paper Cut” is a dance-able number with some nice arrangements and vocals; at moments, it reminds me of Heaven 17’s best mixed with Numan’s poppier-moments. The interesting moment is (what I would envision as a 12″ single) their version of Nirvana’s “Come As You Are” (not sounding like Killing Joke here); it’s the second time in a few months that someone has covered Nirvana with synths, but this makes a song I had previously not cared for far more enjoyable by this re-imagining. “Cellophane” is very O.M.D.-flavored; again, pleasant, light and brings me back to another time. Four songs – a fine introduction. I think I’ll be keeping my eyes and ears open for more from Adventure Set. Some things from the ’80’s were best left behind, but this is a good reminder of how synth-pop could be, when done right.